Manufacturer and supplier of ladies garments, men\\\'s garments, leather garments, kids garments, home furnishing, accesories, etc. Mushkis Creations are manufacture and exports ladies leather bags. Manufacturer and exporters of ladies leather bags. Manufacturer and exporter of leather bags such as ladies hand bags. Deals in ladies leather handbags and other bags. 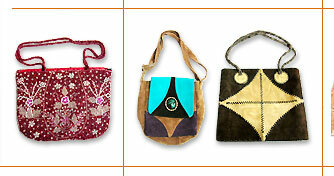 Manufacturer and exporters of leather ladies bags. Manufacturer and exporters of ladies garments, essential oils, fashion bags, silver jewellery, leather products, quilts. Manufacturer and exporter of leather bags, shoulder bags, ladies purses, window and folio case, fall winter bags, evening hand bags.